After several decades working in the sciences I am still troubled by the awkward conventions of neutrality that were drummed into us as students, for example how we must not to write reports or academic articles in the first person. No “I” or “we”. “Data were collected” or “this report demonstrates”, as if data collects itself or reports self-publish. I let “I” sneak into work these days, partly as a reminder that research is carried out by people. 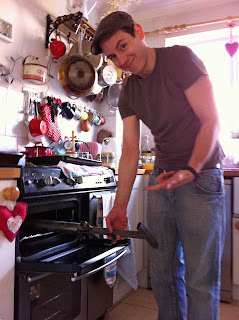 For example Pete who, in the photo above, has our new corer wedged into the oven of his flat. The new corer is a marvel of practicality. The bottom end of the tube is sharpened and has cut through sediments that are reinforced with a lattice of bulrush rhizomes as easily as it does through softer muds. The top of the tube has extra flanges so you can push down with your foot too. A wooden plug allows the sediment to be pushed out, the plug attached to a calibrated rod so we can measure precise slices. It is this plunger which has caused trouble. It is beautifully cut to be flush with the inside circumference of the core tube, but the wood has swollen in the water and got stuck. Dave says this would not happen if it were made of mahogany wood. So, in addition to the elegant steel engineering we can perhaps add a touch of high class woodworking. Meantime Pete has stuck the core in the oven to dry out the bung. This is a fine example of the “we” in science. Dave designed the core; that is a real skill. Pete has been trying it out in ponds containing glutinous goo through to others solid with roots and rhizomes; that is a real skill too. Getting a corer that works slickly and effectively across all these pond types is important so that we can take equivalent cores and slice the columns of mud into similar sized discs to compare the amounts of organic material trapped through the varying depths of mud. Because the corer allows Pete to extract precise, replicate samples he has been able to work out the density of carbon buried in the sediments. Meantime I am glad he will have to explain why his remarkably well equipped kitchen has a mud corer stuck in the oven and not me. That is quite another skill.